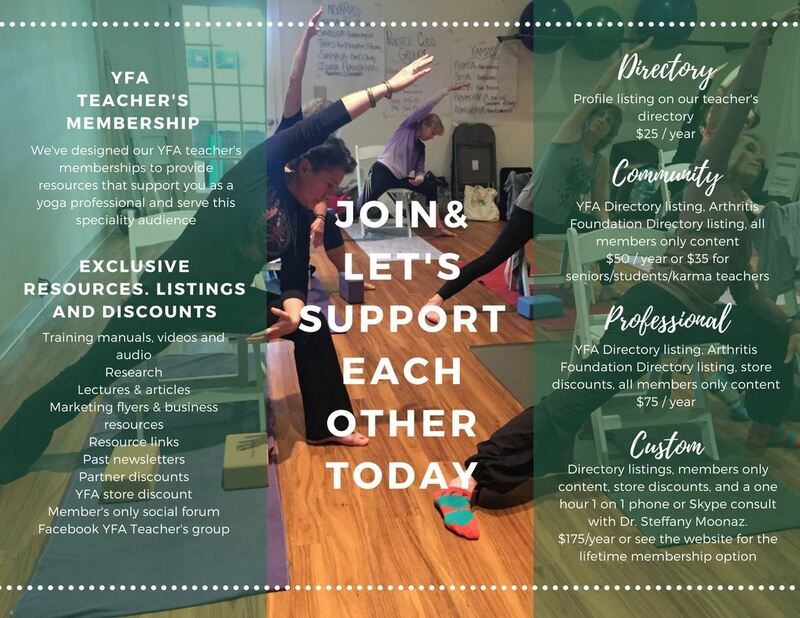 Trained YFA Teachers are open to Membership support in their teaching journey with access to exclusive content, marketing opportunities, and discounts on YFA products. NOTE: If you're a yoga teacher but have not trained with YFA, the first step in membership is taking one of our trainings. You can get more information and see our upcoming training calendar HERE. YFA Teacher Lifetime Membership - $1,000.00 (USD) Subscription period: Unlimited Lifetime members receive lifetime access to the membership section of the website, a personalized signed copy of Dr. Moonaz's upcoming Yoga Therapy for Arthritis book, a 1-hour consult with Dr. Moonaz plus 30-minute follow-up at a later date and a lifetime partner level acknowledgement on the website. That means in addition to the registry profile and lifetime class listings, you receive credit on the homepage with links to your business information. You also receive a lifetime 20% discount on products in the YFA store.